If you missed the first opportunity to soak in the sight of Manhattanhenge, you’re in luck because the phenomenon is making an appearance again this week. The celestial display makes an appearance only twice a year, with Manhattanhenge 2018 first taking place on May 29 and 30. It will now return on Thursday and Friday. 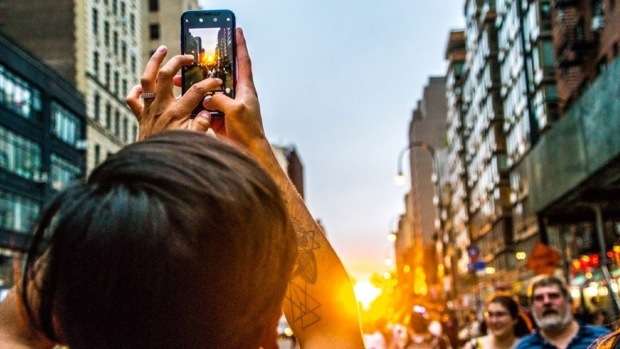 Manhattanhenge occurs when the sunset perfectly aligns with the east- and westwards streets of Manhattan’s grid, which will be at 8:20 p.m. on Thursday and 8:21 p.m. on Friday, according to the American Museum of Natural History. The infrequent event prompts New Yorkers to flood the streets to catch a glimpse and photograph the one-of-a-kind Big Apple sunset.